Got a C band Dish? Posted on May 9, 2017 June 30, 2017 Author rainiergroupCategories Rainier NewsTags 4DTV Shutdown, Big Dish Programming, Bloomberg TV, C Band HDTV, C band programming, c band satellite, C band Satellite Dish, cord cutters, cutting the cord, directv, dish network, Free TV, fta, Glen Musielak, hd c band programming, HyperMegaSat, NPS, ovation tv, powervu, programming center, rainier satellite, Ricks Satellite, satellite receivers limited, satellite tv, skinny bundle, skyexpress, Skyvision, SkyXpress, SRL, sTags 4DTV, Tek 2000 amazon, tek2000, titaniumLeave a comment on Got a C band Dish? 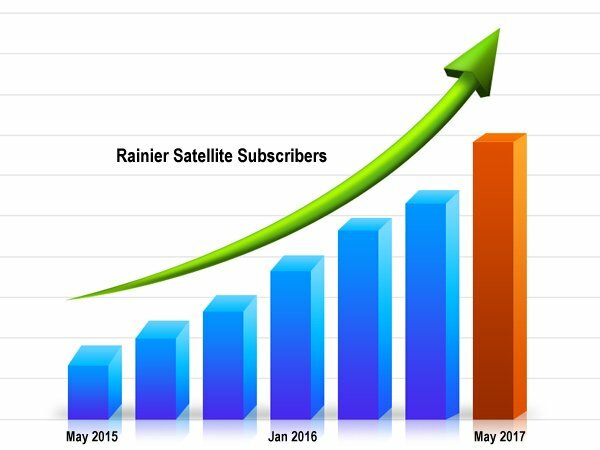 As of May 15th 2017 Rainier Satellite’s been open and selling to the general public for 2 years. We’re glad to report that in this time C band subscription sales have skyrocketed. While other traditional means of pay TV delivery are showing a fall in subscribers, this is not true with Rainier. We attribute this growth to many reasons. Offering the best HD picture available anywhere. 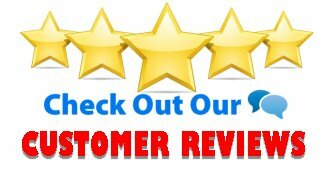 Fair pricing and choice, No contracts, No HD Fee’s, No Rain or Snow fade, Excellent products, Excellent customer service and support. 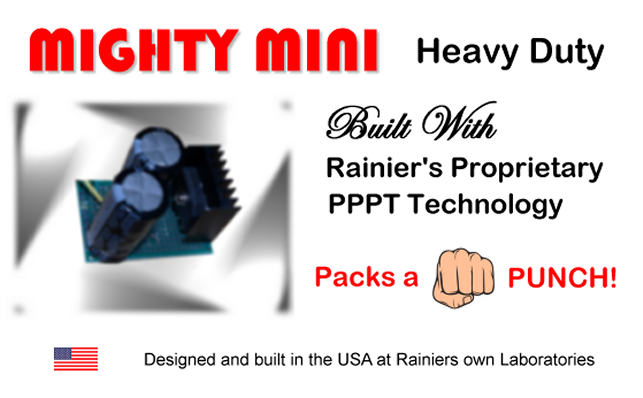 Many that have signed on with Rainier have expressed their disgust with the high prices being paid monthly with cable and small dish systems. 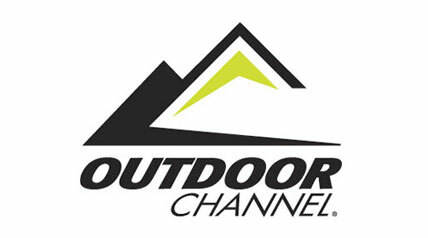 They are glad there now is an option to get programming they enjoy at low monthly cost with many free channels included. 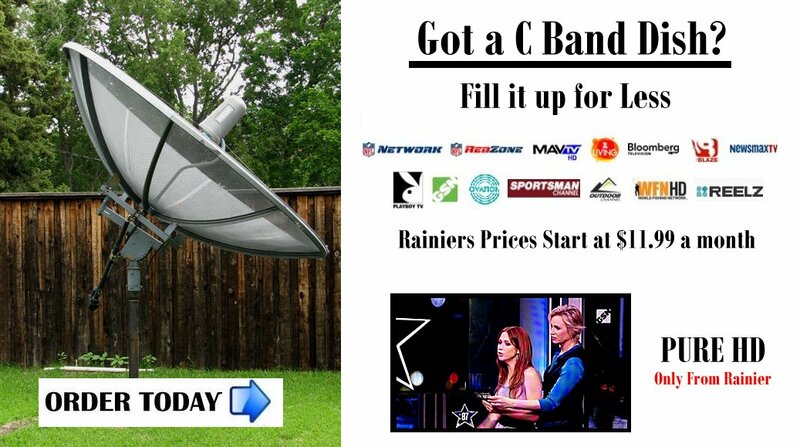 C band has historically had lower prices than cable and small dish systems.This tried and true business model continues with Rainier. 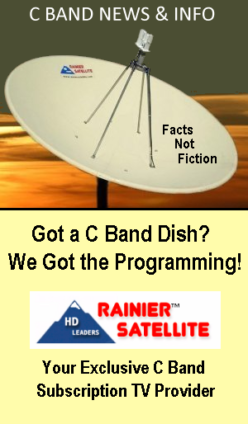 While everyone else that served c band over the years may be gone, Rainier is here to stay and dedicated to C band. 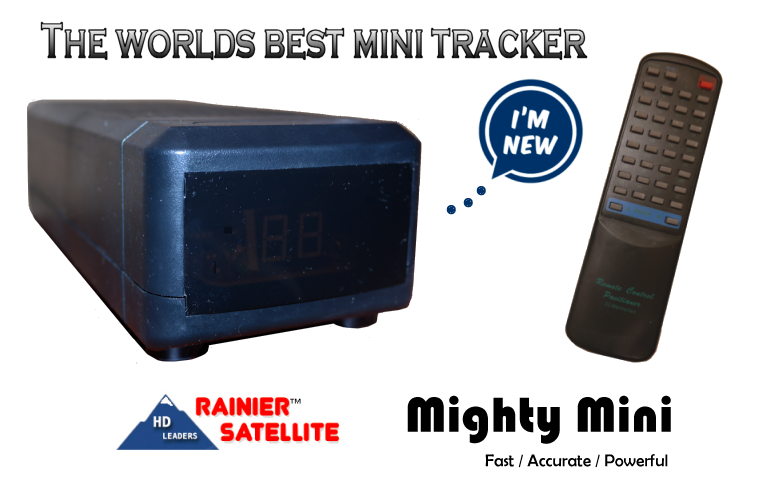 Get on board with the best kept secret out there Rainier Satellite. 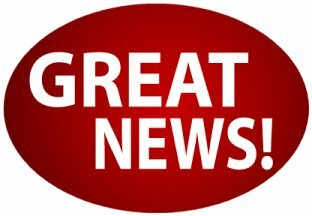 Rainier Satellite is proud to announce the addition of 3 new Pure HD channels that are being added and will launch in our lifeline basic package at no extra charge. Stay tuned for the launch date. 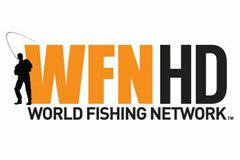 We wish to offer a warm welcome to the Sportsman’s Channel, the Outdoor Channel, and the World Fishing Network all in Pure HD only from Rainier! Stay Tuned… More Great News with More New Channel Announcements right around the corner. Rainier Satellite. WE ARE DEDICATED TO C BAND!